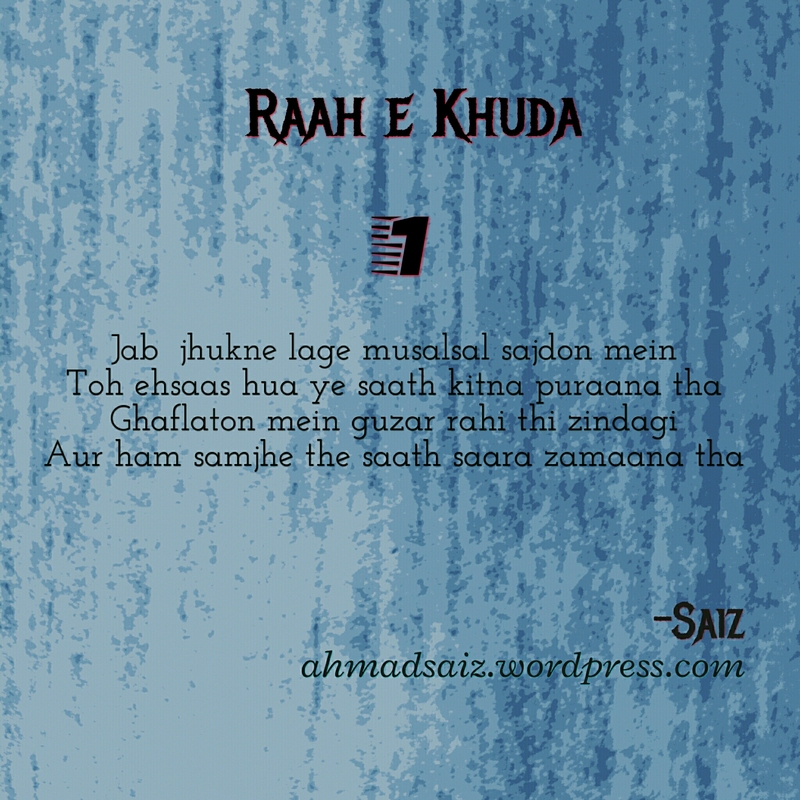 Raah e Khuda: #1.~Jab jhukne laga… ~ – I'm Here; Right Here. Firstly, I would like to acknowledge why I’m upbringing this Urdu Poetry section upon my blog. Though I earlier decided that it would be an all English blog. Well! There are so many amongst us who practice Urdu language too. But, that’s not the sole reason gradually. Its just that I don’t want to make it trembling for me to work upon three blogs simultaneously as I already have two. I hope you readers love to read these. I will try to justify the interpretation thing to the best I can. Transliterating an Urdu poem into English is just a vain, amorphous disparity. To be honest. I meant, this poem. You already read the other poetry of this section. Well! Nice to see you around. Aap kis cheeze ki baat kar rahay hain? That I read alot of your old posts on you blog? This left me starstruck. What else are you good at, Saiz? Everything you’ve written and I have read, is literally out of this world. Waiting for more. Keep up the good work man! I won't keep you waiting for long. Oh, yeah right. Will keep checking. Btw,What does gaflat mean.. Something related to drowsiness perhaps? Yeah, somewhat like that. But for extracting an easy meaning, you can go with “ignorance”. “ghaflat” means “the state of being wrong thinking of being right”. Well I believe I am made that way- to love. This was the first one of the chain of posts coming up. Wa antum fa jazakumullahu khair bro. And please remember us in our prayers. You made it rhyme even in English!! And I don’t know if I am being biased due to my background knowledge in Urdu but I believe that poetry and expressive emotions always flow much more beautifully in Urdu than English. I haven’t written Urdu poetry much but whenever I do I’ll try to share! No, I too agree with your perception about Urdu language. I bet it does. You don’t need to think to conform while writing Urdu but when you have to translate the expressions and emotions to capture the essence, it’s hard. I am impressed because I didn’t know guys could be so expressive. You are so correct to each word you pressed upon. You are way more expressive than I actually can be. Yup you guessed right. Society places pressure on guys to be tough. To not express emotions. I guess that’s why my brothers and father keep it in. You are true here again. But, are those the only males you have met till date? Haha I would be honoured to be equal. Aa.haa….not bad for a Muslimah. This is beautiful. I’m looking forward to more. That was really very nice of you. I’m so happy that you loved this one.